When I saw this recipe, I knew I had to try it. What a cool way to serve a hot dog! This recipe is adapted from Return of the Yummy. I'll need to work on my dough shaping technique a bit, but it's fun, so I look forward to the challenge! 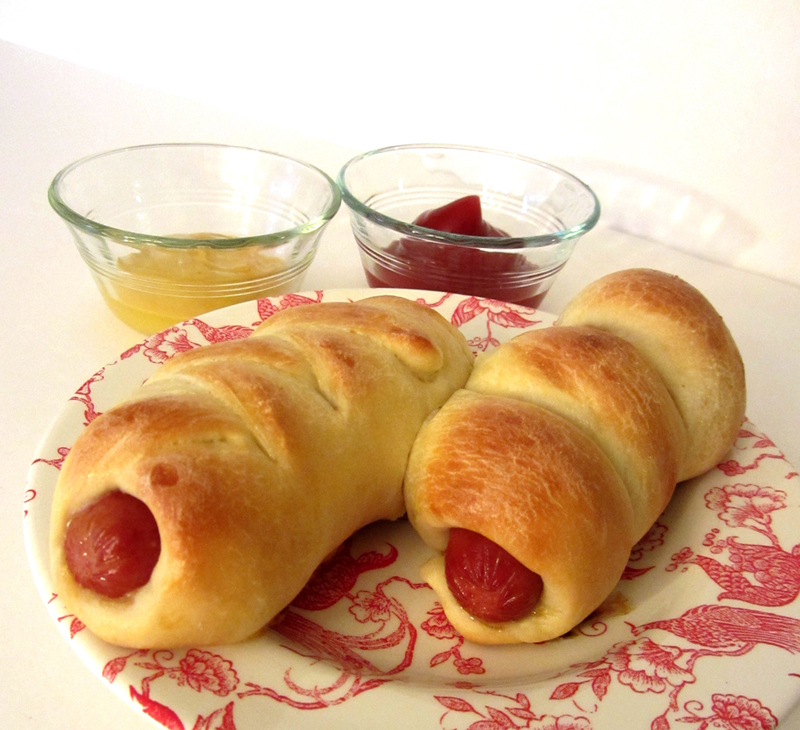 These yummy buns are a fun and delicious way to dress up your favorite hot dogs. Yum yum! 1. In a small bowl, stir together the yeast, sugar, and water. Set aside to bloom for five minutes. After the five minutes, you should see foam or bubbles at the surface. If not, your yeast may not be good. 2. Stir 2 1/4 cups of the flour and salt together in the bowl of a stand mixer. 3. In a bowl or liquid measuring cup, stir together the milk and butter (this will warm the milk and cool the butter). Whisk in the egg until everything is well blended. 4. Mix the wet ingredients and the yeast mixture into the dry ingredients with a wooden spoon. Stir until the mixture forms a shaggy dough. 6. Attach the dough hook. Mix with the hook for eight minutes. The dough should not stick to the sides of the bowl (it may stick to the bottom). If it does stick to the sides, add more flour a tablespoonful at a time until the dough is the proper consistency. The final dough should be soft, but not sticky. 7. Place the dough ball in a lightly oiled bowl, turn once to oil the top, and cover with plastic wrap. Set the bowl in a warm place to rise until doubled, about an hour and a half. 8. Divide the dough into eight equal portions (about 3 oz each - using a scale is very helpful). 9. Line a baking sheet with parchment paper. Work with one piece of dough at a time, keeping the others covered to prevent drying. For the twisty bun, roll the dough into a log about twice the length of your hot dog, tapering the ends slightly. Begin on one end of the dog, and twist. You need to made three loops of dough over the dog. Tuck the tapered ends under the hot dog. For the braided bun, roll the dough into a rectangle with the long side equaling the length of your hot dog. Dry a hot dog with a paper towel. Place the hot dog in the center of the dough. Cut strips into each long side of the dough (either side of the dog). Four strips will make a nice wide braid. Eight strips will give a detailed braid. Cut an equal number of strips (4-8) per side. Fold the strips, alternating left then right, over the dog. 10. Place the bunned hot dogs onto prepared baking sheet. Spray or brush them lightly with oil. Cover the sheet lightly with plastic wrap. 11. Let the buns rise until doubled, about an hour. 12. Preheat the oven to 400°. 13. In a small bowl, beat the egg together with the water. Brush the egg wash very gently onto the buns. This will make them turn out golden and shiny (the ones in the photo were washed with egg yolk and water only due to allergies, hence the lack of shine). If you'd like, sprinkle sesame seeds over the egg wash.
14. Bake the buns for 8 minutes. Reduce the heat to 350°. Bake for an additional 5-8 minutes or until golden. Serve (they are very hot - letting them cool for 5 minutes is probably a good idea)!